Some wild species — like the furbish lousewort flower and Kirtland’s warbler — are endangered. Others are at plague levels. Oh, yeah. Virtually every high-volume shooter of centerfire varmint rifles knows cleaning is essential, but not all remember, especially after a long winter layoff. Hey, we’re human, and it’s all too easy to put off cleaning a rifle at the end of the season. It’s equally easy to forget at the start of a new season. So don’t forget. Clear your varmint rifles now. And clean them well. Better than you ever have before. I hate to accuse you, but I’m just playing the odds here. Most shooters, even the careful, finicky ones, don’t clean barrels as well as they could or should. And it’s not because they don’t try. It’s because they can’t easily see what they’re cleaning. That doesn’t always work. Follow a pristine white patch with a 10-minute solvent soak or copper solvent soak and the next patch will probably emerge gray or blue. Follow another white patch with some JB Bore Compound and more gunk emerges. You might make 50 to 100 passes down that bore with various solvents, brushes and patches and still not be clean. So how do you know when you’re done? Your rifle will tell you. Clean is a matter of degrees when its done for accuracy. Some barrels shoot just as well dirty as clean. Some shoot well with copper fouling but not carbon fouling and vice versa. Some are good after a light cleaning and some insist on bare metal. But not many. Target shooters regularly fire two or three fouling shots through a clean barrel because they know a lightly fouled barrel will shoot more consistently than a super clean one. So here’s what you need to do. 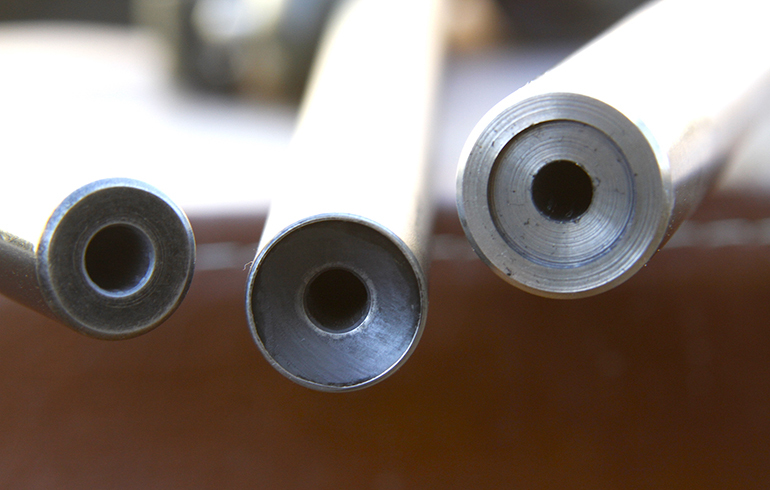 Clean your varmint rifle barrels. Thoroughly. Fire a couple of fouling shots and then shoot some groups with your favorite ammo. Then go varmint hunting, keeping track of how many rounds you fire. After 10 or 20 rounds, shoot another test group. Do the same after every additional 20 rounds. Eventually you’ll learn how dirty your barrel has to get before accuracy falls below your acceptable level. Then you’ll know when to clean it.